Est toit est une ancienne grange avec des vues spectaculaires situés dans une position surélevée près du village de Gunnerside. La région est célèbre pour son histoire minière de plomb et offre une abondance de promenades directement à partir de la porte sur les landes et le long du fond de la vallée. Ce qui en fait un endroit idéal pour explorer le parc national de Yorkshire Dales. Entouré par la campagne ouverte, East toit bénéficie d'un emplacement calme et paisible. A 5 minutes à pied vous emmène au village préservé de Gunnerside avec ça licence restaurant et un café. Sur un vendredi soir vers 12 heures 7. le poisson et de la puce camionnette circulant entre en Gunnerside. Un court trajet en voiture vous emmène vers les villages de Muker et Reeth qui offrent de bons alimentaires, pubs et boutiques. Le gîte dispose de son espace, toilette et 1 chambre simple vivant sur le rez de chaussée avec les autres chambres à l'étage inférieur, vous permettant de profiter de la meilleure des vues fantastiques. Le salon a un feu à charbon ouvert avec tout le carburant inclus dans le loyer. Nous fournissons un téléphone mobile pour une utilisation d'urgence. Il ya 3 signaux des téléphones mobiles au chalet et EE. WC et lavabo au rez de chaussée. Le sous-sol: Salle de bains avec WC, baignoire et lavabo Salle de douche séparée. Notes sur l'hébergement: Un animal bien comporté par arrangement. Interdiction de fumer. À l'extérieur: Jardin privé privé plein sud avec mobilier de patio principalement aménagé sur pelouse. Des vues impressionnantes dans tous les sens. Les serviettes et les draps sont inclus dans le loyer. Autre: La machine à laver est au rez-de-chaussée et le sèche-linge est dans le magasin à l'extérieur. Il y a amplement d'espace pour les cycles à stocker et des vêtements de marche à sécher dans le magasin à l'extérieur. Superbly located and beautifully appointed accomodation with a stunning view! It was a pleasure to be welcomed in person by Diane and to stay in such an utterly delightful accommodation with glorious views over the Swale valley. The area is a walkers paradise and full of local interest and excellent pubs. The cottage was beautifully equipped with every home from home amenity and excellent WiFi. It is a wonderfully quiet location but with lovely walks from the doorstep and a pub just a short stroll down the hill. We did one day open the front door to find a cow on the drive! But it just ambled off up the hillside most amiably. The village fish and chip van on a Friday night was a popular event and the fare very tasty. I would highly recommend this area to those who enjoy country walks and views. Food shopping is available a relatively short drive away. For those like us who visit with a pet dog, the enclosed back garden is ideal. A truly charming cottage. Thank you to Diane for making our stay so pleasant and for the scrumptious home made biscuits which were much enjoyed and greatly appreciated. Thank you for taking your time to give East Roof such a lovely review. I am glad you enjoyed your holiday and the weather was so kind to you. East Roof was everything we could have asked for - very peaceful and quiet, warm, cosy, comfortable, spacious, very clean and well maintained. Gorgeous views with somewhere to sit to enjoy them and wildlife on the doorstep. It was great having a welcome from Diane and being shown round and how things worked. Everything we needed and more was provided with plenty of hot water too! The cottage is in a great area for walking and exploring and the village has a decent pub and a couple of tea rooms. Would recommend the bistro for Sunday lunch. Lots of surrounding villages also have excellent tea rooms and pubs - Muker tea room cream tea is very generous and the Black Bull in Reeth do a good Sunday carvery. I highly recommend this cottage to others. Eastroof was very clean, spacious and everything you needed was there. The central heating was very efficiant and the coal fire was great. Thank you so much for your great review, I am glad you enjoyed your first stay at East Roof. I hope to see you both again in the future. Our stay again at this Comfortable Cottage was outstanding, we always feel like we've come Home when we arrive here for our Family Holiday. We have stayed here several times over last 5-6yrs and never been disappointed with Cottage it's facilities or Weather. The Walks in surrounding Area are Excellent and have a look ways been popular with my Husband and 2 Boys. Thank you for taking the time to give us such a lovely review. I am glad you enjoyed summer in Swaledale as I know you usually come in October. I look forward to hopefully seeing you all again in the future. 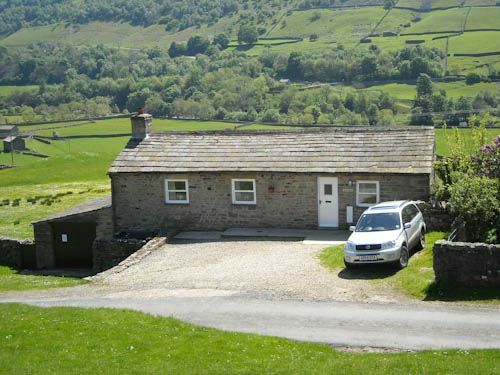 The cottage was in a beautiful location.Only a stones throw from Gunnerside which has a pub and a coffee shop. Askrigg and Leyburn.We would recommend the Black Lion Hotel in Richmond for afternoon tea.It was £9.95 for afternoon tea for two.This included a sandwich of your choice,a strawberry tartlet and a scone with jam and butter as well as a drink (soft drink,tea or coffee).We loved it. I would recommend this cottage.Everything was first class from the first booking contact with Diane up until the finish of the holiday.Any queries before the holiday were answered quickly and the cottage was lovely. Thanks Diane.We all had a great time and cannot wait to get back..!!! Thank you so much for your terrific review. I am glad you and your family enjoyed your first visit to East Roof. I agree with the review of the Black Lion in Richmond for its afternoon tea!! I look forward to seeing you all again in the future. Very helpful and understanding owner - assisted us all the way - lovely touch of home made biscuits on arrival. The house is well equipped. Very peaceful and child friendly - 4 children age 6-9 years old. Good outdoor fun. Beautiful area to walk in - we all went on a bear hunt (parent will understand the book reference). The beds were very comfortable, we all slept well. The kitchen held up with us staying in and cooking a variety of meals for 6 people. A truly amazing area to stay - James Herriot countryside. It was the best holiday that we have ever had. Partly due to the area but also the house was a home for a week which enabled us to relax and enjoy the time away together. Thank you so much for the accommodation and kindness. Thank you so much for your great review. Look forward to seeing you all again in the future. Gunnerside est à seulement 5 minutes à pied, il y a un Smithy et un musée, Ghyllfoot Tearoom et bistrot qui sert également de Take Away (réservation recommandée). Richmond est une ville de marché géorgienne qui tient son marché un samedi. Il y a la station avec son cinéma 2 écrans et son restaurant. Richmond Castle surplombe la ville, avec une promenade au sommet du Keep a must. Le théâtre géorgien est le théâtre le plus ancien du pays et peut être vu par des visites guidées quotidiennes. Hawes est une ville de marché rural qui a ses ventes aux enchères de marché et de bétail tenues mardi. Booking Notes: Please contact owner on 01748 818680 to enquire or book. Please check for late availability or for a short break. Change over day is Saturday Leaving at 10.00 am and Arriving at 3.00 pm New visitors to East Roof will be shown around by the owner when they arrive.